Photo by Willoughby Gullachsen (Gus), no reproduction without permission. Ice Dance was a ‘Screen Two’ drama which went out in March 1989. It was written by Stephen Lowe, directed by Alan Dosser and produced by Michael Wearing. The drama starred Warren Clarke, Joanne Allen, Andrew Fletcher, Amanda Worthington and Helena McCarthy. It followed the story of a pair of young skaters from Nottingham, whose dream was to emulate Torvill and Dean. 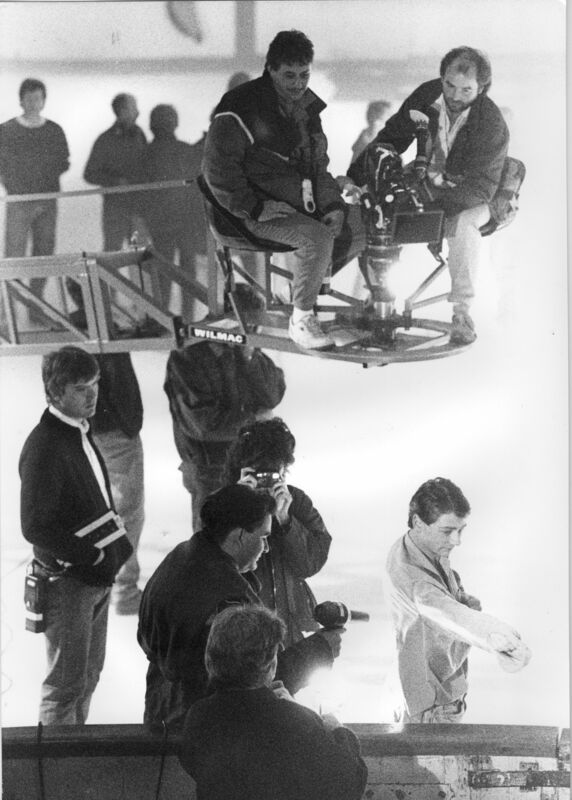 This photo features cameramen Keith Froggatt and Steve Saunderson on the crane, and 1st AD, Will Hartley on the left under the crane.